It may still be too early to applaud, but the promises we’ve been hearing for so long about the rollout of a comprehensive plan for the rest of the city’s neighborhoods comparable to what has been done for the city’s downtown and Midtown areas appear to be taking shape into a visible reality. In short, the Detroit Design 139 Exhibit, which opens to the public at noon this Thursday, September 14, on the first floor of the 1001 Woodward building, offers a window view into what Detroit’s neighborhoods will become over the next decade or so. This is not just a dream or a vague concept; this is a map of plans that are either already underway or that at the very least have starting dates attached for 38 planned neighborhood transformations. The exhibit closes on September 30, but there will be more exhibits in coming years designed to offer Detroiters to track visual progress of what is being done and what is planned. The following is from the Detroit 139 “Vision Document,” which was distributed in advance of the exhibit. “Detroit Design 139 is a collaborative architecture advocacy platform that organizes thought-leadership design initiatives focusing on Detroit’s future built and natural environment. “Detroit shapes Design. For generations, Detroit has advanced modern urban development with innovative design practices; the integration of the first stretch of paved concrete on Woodward Avenue, the nation’s first tri-colored traffic light, and the contribution to mass-production through innovative technology in automotive manufacturing. These evolutionary design interventions have influenced built environments throughout the world, contributing to a new way of life predicated on modern ideals of speed, efficiency, and clean, a-historical, functional aesthetics. Because of this strong design legacy and international influence, Detroit was recently awarded the first UNESCO City of Design designation in the United States, joining a worldwide network of cities committed to utilizing design as a driver for sustainable urban development, social inclusion, and cultural vibrancy. What’s being exhibited is the result of a collaboration between a number of partners, including the City of Detroit and Dan Gilbert’s Bedrock Detroit, the two largest partners. Other members of the steering committee include AIA Detroit, Detroit Design Festival 2017, Detroit Creative Corridor Center, Unesco Detroit City of Design, University of Detroit Mercy, University of Michigan’s Taubman College of Architecture and Urban Planning, NOMA Detroit, and the Detroit Riverfront Conservancy. “We’re very fortunate that Detroit has a legacy of design. 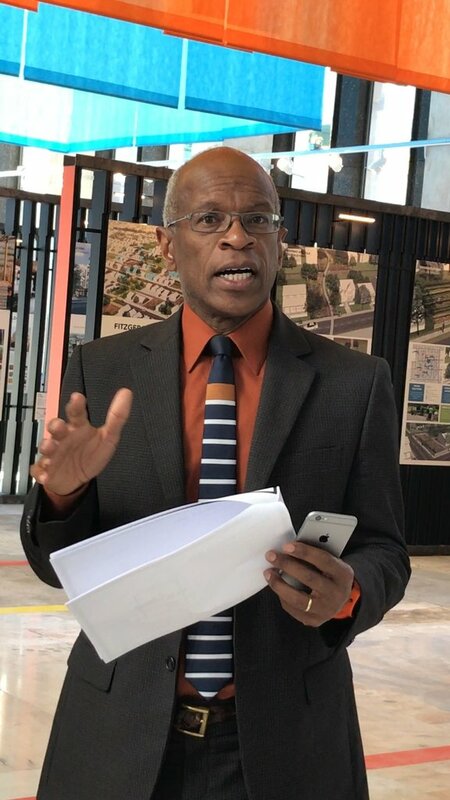 …we feel that we’re building on something that Detroiters instinctively understand,” said Detroit Planning and Development Director Maurice Cox at a Tuesday press conference previewing the exhibit opening. The two suspicion-laden observations almost certain to follow from ever-watchful critics are why is this event happening now prior to the November mayoral election, and exactly how much influence will there be from Gilbert, the downtown power player who was named a “shadow mayor” of Detroit in a recent Politico article. Given the amount of power Gilbert wields in downtown Detroit’s development planning, there is bound to be some unease in some quarters about whether the rest of Detroit is at risk of becoming an expanded version of ‘Gilbertville’. While that worry can’t be easily erased, the overwhelming need – and desire – for the actual revitalization of the rest of the city’s neighborhoods would suggest that this approach at least be given the benefit of the doubt, particularly since community input and participation has been a valued part of the process with literally hundreds of community and neighborhood meetings that have taken place throughout the city soliciting input over the past year or more. This is in line with what Cox has been saying – and working on –ever since he began his tenure almost exactly two years ago. Critics (myself included) have pointed frequently to the disparity between what was going on in the 7.2 versus what was going on in the rest of the city’s 139 square miles. Although there were certainly areas where some progress was being made, it nevertheless seemed hard to reconcile the seeming aggressive enthusiasm surrounding all that was booming in an area that seemed to becoming more and more white contrasted to the rest of the city where the city’s majority 83 percent black population was living. Just this Tuesday, Little Caesar’s Arena kicked off its opening with a series of six concerts to be performed by Kid Rock, who will also have a restaurant anchored there. By now the controversy is well-known so no need to go over it all again, except to say that the protests surrounding that event were yet another highly visible example of the intense resentment that continues to simmer among some of the city’s residents who continue to argue that they are not just being left behind but steamrolled to make way for a New Detroit that will not look anything like them. Hopefully this will be the beginning of a long-term effort to reverse that perception once and for all.